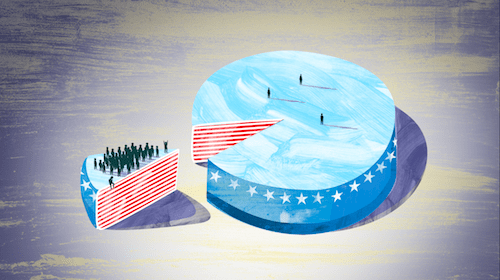 America is divided—economically, politically, and culturally. Income inequality is at virtually unprecedented levels. Political polarization has risen to new heights (although the public is less polarized than their elected representatives). And we are sorting ourselves into distinctive cultural tribes that increasingly live in different communities. The proportion of parents who would be disturbed if their child married someone from the opposite party has risen from 5 percent in 1960 to about 50 percent now. The election of Donald Trump didn’t cause these divisions, but his presidency is exacerbating them. With midterm elections fast approaching and the future of our political system at a crossroads, the question on everyone’s mind is: what can we do? In an attempt to answer this question, I spent the last two years studying people I’m calling the “forgotten Americans”—those who’ve been left behind by our evolving economy, many of whom voted for Trump. That work gave me some tentative answers, which I’ve published in my new book, The Forgotten Americans: An Economic Agenda for a Divided Nation. But it also reaffirmed how difficult these questions are, and how none of us—myself included—has all the answers. As part of my research, I met with some of the forgotten Americans themselves. What did they think of my solutions to these problems? I went to Syracuse, New York; Greensboro, North Carolina; and St. Louis, Missouri. The people I spoke to were diverse in terms of age, race, occupation, and political leaning, and had modest incomes—less than $70,000 a year—and no college degree. I asked them how they thought of themselves. President Trump had said he was going to pay special attention to “the forgotten Americans”—did they think they were part of that group? Some said they were; others thought he was talking about veterans, or the homeless, or those more disadvantaged than they were. When asked to say how they self-identified they gave a variety of answers from “lower middle class” to “working class.” A few spoke poignantly about being raised in “upper middle class” circumstances and then suffering downward mobility as an adult. Someone said she was in the “holding-on-by-your fingernails” class. Here, I report on what else I heard from them, with the hope that their voices can inform decisions made by our elected leaders. Let’s begin with values. Unless policy reflects widely supported values, representative democracy will not flourish. The broader public simply cannot spend 40 hours a week studying the details of every policy proposed at every level of government. But they want government solutions that reflect their values and priorities—education, work, and family, but especially work. When candidate Trump told people he had their backs, many believed him. His agenda of restricting trade and immigration and bringing back manufacturing jobs appeared to directly and concretely address their problems in a way that talking more abstractly about boosting growth or redistributing income does not. Sometimes I wondered if these comments were just a lot of bravado, a protective shield against misfortune. One unemployed 42-year-old from Greensboro said, “You can’t count on nobody for nothing. You’ve gotta be able to do it yourself and nobody’s gonna treat you the way you want to be treated.” That perspective is admirable for what it says about this individual’s strength of character, but sad in terms of what it says about his faith in his community. Yes, I heard some hostility toward immigrants and those receiving benefits, but I heard much more about resilience and a strong sense of responsibility. I heard very little about how the system had let them down, or about what many analysts rather antiseptically and vaguely call “structural factors.” Juxtaposed against difficult circumstances, their “can-do” attitudes and sense of responsibility for their situations were deeply impressive. I was the one who felt deep shame that our wealthy country has done so little to make it easier for them to improve their lives. There was a predictable divide in the political opinions of focus group members, as well as in the degree to which they believed that the new administration was on the right track. Many were reluctant to discuss politics, knowing how divisive the topic can be. But when they did voice a political opinion, it typically related to how ineffective, untrustworthy, and out-of-touch they believe government is, especially at the federal level. These interviews confirmed what is evident in national survey data: many people distrust government, but also expect it to align with their values. How can policy address the grievances of these forgotten Americans? I took seven ideas to the people I met in Syracuse, Greensboro, and St. Louis, and asked for their feedback. Here’s what I learned. I suggested that every high school graduate be expected to give a year of national service (military or civilian) in return for some help paying for college. This is similar to existing programs like AmeriCorps, but I added a new twist: an American exchange program in which families across the country would volunteer to host a young person from another community while they were doing their service. It’s a variation on foreign exchange programs but with an entirely domestic focus. I was surprised by the almost unreserved enthusiasm for this idea. Some were familiar with the underlying concepts—a few spoke favorably of their experience with AmeriCorps. Those from Syracuse connected the idea with the “fresh air fund,” a program that allows inner city kids to spend the summer with an upstate family. They quickly understood that an important benefit of the American exchange program would be people getting to know those from communities or backgrounds unlike their own. They appreciated the educational benefits as well (although those from New York pointed out that the promise of free tuition at public universities in their state made that benefit less valuable). Of all the policy ideas I talked to people about, this one was the most popular. There was a palpable sense that the country is coming apart—socially and culturally—and that this idea had the potential to address these divisions. The other clear favorite was providing more career and technical education at every level, linked to the jobs that exist in local communities. The people I talked with believed strongly that many don’t have the education and technical training needed for today’s job market. They also liked the idea that skills are something that you can take with you to any job or community. To address these concerns I proposed a worker tax credit to boost wages that would function like a simplified and expanded Earned Income Tax Credit (EITC), available to all workers earning less than $40,000 a year, up to a cap of about $1,500 a year. Initially, participants had a hard time understanding how the worker tax credit would work. They are not alone. The EITC (which primarily helps single parents, not all low-wage workers) is an incredibly complicated program, which is one reason it has been plagued with error rates. To clarify the policy’s impact, I reframed it as “lower taxes for those making less than $40,000 a year.” Articulated this way it was very popular, although a few people worried that it would be gamed in some way. One reason tax breaks for those under $40,000 were so popular is because participants recognized that people in their situation have many things they can’t afford and believed tax cuts would help on multiple fronts, not just one. What if we reformed the business tax code to encourage employers to invest more in—and share more with—their workers? Given their deep distrust of government, I argue that the private sector should be a key part of efforts to improve the lives of this group of forgotten Americans. Some of the $1 trillion in corporate tax cuts in the 2017 tax law needs to be reallocated for this purpose. What I heard from those I spoke with indicated I was definitely on the right track with this approach. Participants believed that employers are trying to skimp on providing the wages and benefits they once offered by hiring temporary, part-time, or contract workers. When asked what should be done in addition to providing better pay and benefits, a few even specifically suggested the approach I emphasize in my book: encourage businesses to share profits, provide broad-based stock options, and offer matching 401k contributions to more workers. Most participants thought that employers should pay for performance and cut CEO pay, but they also wanted more appreciation and respect, not just more money. One 60-year-old cashier from Greensboro noted that employees aren’t given enough recognition for their loyalty to a company or their commitment to being part of a team, saying, “they should get special recognition, even if it’s a piece of paper that says you did a great job this year.” A 34-year-old community specialist said, “because of people’s wages, lack of training and all the other things that we discussed, a lot of people go into their jobs and they absolutely hate it but they know they have to go to work to provide for their self.” A worker in St. Louis said, “you get a really vicious circle going because people develop a bad attitude, so they don’t have any loyalty to the company, the company doesn’t have any loyalty to them.” A St. Louis participant said, “It’s like [employers] just didn’t care, it’s like you’re more of a number than … a person they hired.” This kind of resentment may be reducing productivity in ways that are hard for businesses to recognize. I came away sad for the narrative we’ve developed in this country that says we live in a meritocracy and the government is broken. They also noted a Catch-22. Many jobs require experience or training, but how do you get that experience and training if you can’t get into a job that provides it in the first place? Along these lines, others agreed that employers should prioritize hiring from within and provide more opportunity for advancement within a company. People don’t feel secure, either. They noted that a lot of jobs are now done by temps and that contract work is more common. As a Syracuse participant put it, “I think we’re all easily replaceable.” And another said, “they don’t have to give you a reason to fire you.” I asked about the role of unions in improving their lives, but got few responses, perhaps because membership has declined to very low levels. Affordable health care probably topped the list of these three issues people worried about, but there were plenty of complaints about the high cost of child care and a lack of paid leave as well. Paid leave also got some attention, especially in Syracuse. Both a 36-year-old warehouse worker and a 25-year-old father who was unemployed put paid leave at the very top of their list of priorities. The latter said, “I just had my twins and that really put a big stop on my life. I had schools I wanted to go to. I had things I was gonna do.” Two other participants talked about relatives who had had cancer or some other serious illness and noted that the lack of paid leave decimated their incomes and drove them into poverty and dependence on government assistance. To pay for a worker tax credit or other new benefits, I considered a value added tax, a tax on carbon, or a tax on big estates as a way of offsetting the cost of reducing taxes at the bottom. Individuals I talked with were extremely divided on whether taxes should be increased or lowered. As noted earlier, many believed that taxes on modestly-paid individuals should be lowered. Yet, when confronted with the fact that the federal debt was large and growing, and that new tax cuts would be expensive, quite a few resisted the idea that anyone needed to pay more. However, others were amenable to the idea of higher taxes, especially on the wealthy and especially if the revenues were earmarked for something specific. Participants in Greensboro were mostly enthusiastic about higher taxes on the wealthy, suggesting that “the billionaires” wouldn’t miss the money and that the revenue could do a lot of good. Others noted that taxes are critical to paying for the services that government provides, and that the country simply cannot afford the kind of tax cuts that have been handed out in recent decades. Many participants liked the idea of a flat tax. I was surprised that they mentioned this idea, which implies that everyone would pay the same percentage of their income in taxes. But it dovetails more with a value added tax, the equivalent of a national sales tax, than with a progressive income tax. It might be regressive but need not be if the revenues are used to benefit the bottom half and an income or wealth tax is preserved for those at the top. It’s time we ask ourselves how long our democracy can survive when so many of its people have lost faith in their government. Among those who were not in favor of higher taxes on the wealthy, the opposition was based on their belief that the wealthy “worked hard for their money,” so “why are we gonna beat them up for it?” But much of the skepticism stemmed from uncertainty about how current taxes are being used. As one 39-year-old from Greensboro put it, “We’re already paying taxes that we don’t know where they’re going and if they’re being used properly! So … let’s fix that first. And then maybe we’ll think about paying more, but you gotta have a good reason.” And a St. Louis participant said she was against higher taxes on anyone “because they already waste enough of our money as it is.” Some wanted to make the taxes they paid conditional on what they were to be spent on. As a St. Louis participant put it, “I pay one percent income tax in the city and that one percent supports the free museums and the zoo and stuff, and I feel way less bad about paying those taxes than I do about paying my federal income taxes.” This individual’s views also illustrated another theme: more acceptance of paying taxes for specific benefits at the local level than for a far-away government in Washington. Overall, their comments suggested that many working class individuals are opposed to higher taxes, even taxes on the wealthy. Liberal elites who think that we can redistribute income between the rich and the poor don’t understand the definition of fairness that most ordinary Americans hold: If you earned it, no matter the amount, you should get to keep it. My proposal to tax large estates in the same way that they were taxed in the 1970s—thereby raising roughly $1 trillion over a decade—makes huge sense to me but would run into this kind of opposition. The bad news, then, is that ordinary Americans see value in many kinds of help that government might provide, but—given their mistrust, their uncertainty about how the funds would be spent, and their meritocratic belief that people deserve whatever they earn—finding a way to pay for any new benefits looks challenging at best and impossible at worst. Many preferred cutting programs or government expenses they didn’t like. They talked about abuse of the food stamp program, about the costs of supporting “Dreamers” and “illegal aliens,” about the cost of military parades, or special phone booths, or sending the National Guard to the border. They have not focused on the dollar magnitudes involved and the mismatch between the savings from things they think can be cut and the cost of the things they support—such as Social Security and Medicare. This summary of what I learned comes with many caveats. Though I spoke to a few dozen people in three states, their voices are of course not representative of the whole country, and interpreting what they said is inevitably somewhat subjective. However, I think too few of us take the time to listen to what those we think deserve better really want. Like many researchers, I have scoured the literature and the data on these issues and written it all up in a book. Listening to these forgotten Americans reinforced many of my ideas, suggested that others may be naïve, and above all, deepened my understanding. I came away sad for the narrative we’ve developed in this country that says we live in a meritocracy and the government is broken. The common theme is that if you’re having problems, it’s your fault and no one else’s. Even if you want help, you’re not going to get it from elected officials who care more about themselves than they do about ordinary citizens. I see a vicious and harmful cycle in this narrative. The less government is seen as willing or capable of addressing people’s problems, the more the cynicism about it grows. But that cynicism, in turn, breeds a dysfunctional politics that makes a constructive response to the challenges we face virtually impossible. People voted for Trump for many reasons: party loyalty, dislike of the alternative, resentments against immigrants or other groups, and voter manipulation by Russia or others. But the narrative that rose to the top in my conservations is too important to ignore: Some Americans are disgusted with how government has been working (or more accurately, not working) and they want change—any change. When that change is not forthcoming, or doesn’t address their concerns, cynicism can only grow. My main message to liberals is that a new set of big and expensive government programs may appeal to liberal elites and political activists, but will not appeal to the average voter. My main message to conservatives is that all their rhetoric about government being the problem has taken hold—but faith in the market and in corporate America as the solution has not. Americans are arguably just as upset about the failure of corporate tax cuts to solve their problems as they are about various forms of welfare. Still, there was much that I found inspiring in these conversations: the essential decency of the people I spoke to and their resilience in the face of a job market that has turned against them. These forgotten Americans deserve so much more than what they’ve been getting. They are survivors, for sure. But it’s time we ask ourselves how long our democracy can survive when so many of its people have lost faith in their government. 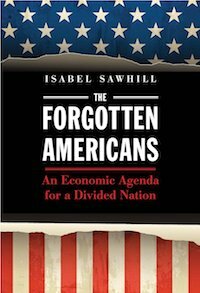 Isabel Sawhill, a senior fellow at the Brookings Institution, is the author of The Forgotten Americans: An Economic Agenda for a Divided Nation, Yale University Press, 2018. This essay is intended to contribute to discussion and stimulate debate on important issues. The views are solely those of the author.